A theme is starting to emerge: the lag time between posts is growing. I’d like to blame it on the holidays, but that won’t work. I anticipate that an equilibrium will come soon, but unless things change soon, the post following this one is estimated to arrive near the end of February. I’ll see what I can do to make sure that doesn’t happen. That being said time has not allowed for posting. My work responsibilities have started to pick up and I’m back to booking shoots with clients on the weekends. Family time takes up the majority of the remaining time and preparation for the Spring running season is well under way. While busy, keeping everyone updated is still important, though it follows a long list of higher priorities. Thank you for continuing to keep Claire in mind in between posts. Your thoughts have not gone unrewarded. Claire continues to make progress. The biggest development since the last post is with Claire’s oral therapy. Claire has a swallow study conducted right before Christmas. The study consists of four consistency stages: honey, nectar, liquid and pulp. Claire passed three of the four. She aspirated the liquid. That was to be expected. Consider what we have to do when we swallow. First, we are usually aware that something is being placed in our mouth and we have intent to swallow. Secondly, we have the ability to maneuver the food or drink into position that gives our esophagus time to protect our windpipe. Claire can’t do this with liquids. Thin, watery liquids move very quickly to the back of the throat. Claire doesn’t have time to notice something new in her mouth before it’s making a rampant march down her airway. This condition is labeled as a delayed swallow. A delayed swallow, however, does not preclude her from consuming the other consistency types. Because they do not move as quickly, Claire recognizes the substance in her mouth and is able to swallow without leakage into her airways. This was great news. We were so encouraged because this milestone yields more therapy options. The therapists have asked the doctors to approve a special oral therapy involving food that is designed to strengthen her esophageal and mouth muscles. This means great things for eating, and it also has corollary effects on speech effort. We have not started the new therapy yet because we are waiting on doctor approval. But it was good news and we’re excited to expand her therapy palette. In addition to Claire’ s therapy changes, we’ve also been noticing changes with Claire’s vision. She is more alert, her eyes more active. Claire picks up on movement at the corners of her eyes more and is tracking objects regularly. She is also watching TV with more purpose and attention. For the last three months, her gaze would wander more. She is fixating on things with greater consistency now. Tiffany got Claire a set of glow-markers for Christmas and that has helped her exercise her vision further. We’re enjoying the changes. The New Year brought a new school with it as well for Autumn and Heidi. This was their first week and we couldn’t be more relieved with the administration and teachers. They have been great and made extra effort to make our girls feel welcome, assuaging the shock that comes with such an abrupt change. Our house was full over Christmas. My parents and siblings all came down to Texas. Only one member was missing: my brother-in-law to be, David, couldn’t join us for the holiday as he balanced work and time with his family. We look forward to seeing him soon. I was excited on Christmas Day because I finally got to announce our family gift. Many suspected it and many were right: we’re getting a puppy. The litter was born on December 22 and will be ready to come home in mid-February. 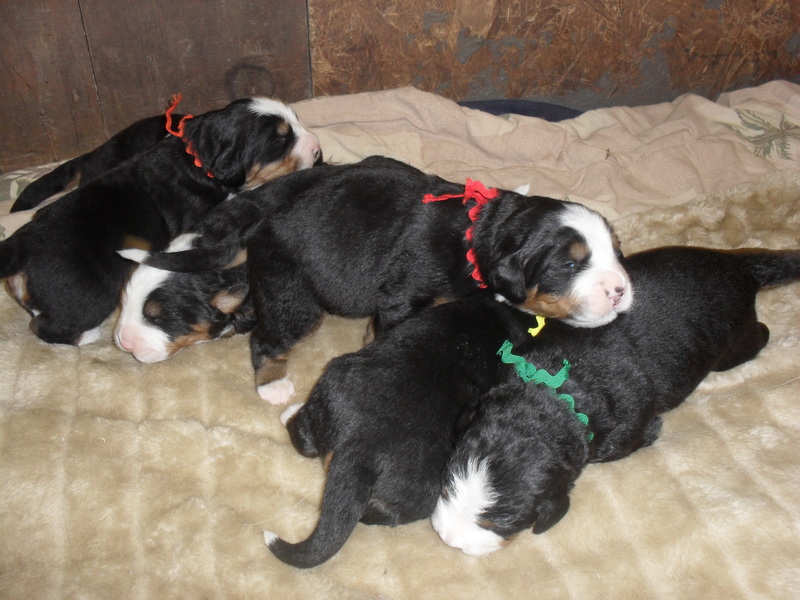 We’re adopting a Bernese Mountain Dog. While everything is going according to plan so far, the jury is still out on the name. Nevertheless, we’re all excited! We get to pick our new puppy next week on the 15th. All in all, the holidays were enjoyable. It was fun having family so close and packed in. And as we enter into the new year, our calendar is already filling up again with out-of-town guests. It makes us happy. We hope your holidays were equally enjoyable. Thank you as always for your thoughts and prayers. We will continue to keep you updated on Claire’s progress. I am doing well. The nurse has been helpful. I took a nap this week! I think as time goes by, I’ll feel comfortable leaving Claire more, but it’s challenging for me. I get time with Autumn and Heidi after they are home, but I don’t think I get more time. The nurse is here in the mornings when they are at school. Thank you for all your wonderful comments Dodie. I hope you had a great holiday season and enjoyed New Years. Thank you for your prayers. Yay Claire! Every bit of progress is wonderful! I love hearing about how well things are moving forward for all of you!! Thanks for taking the time to update us. Thank you for the update! I love all the news you shared and the education about the swallowing process, too! I will keep praying for you all. I’m so excited about Claire’s achievements! Blessings to all! Excited to hear progression is still happing for Claire!!! May God continue his flow of grace and mercy with your family as the New Year is already on its way. Look forward to the next update. So glad to hear of the progress Clare is making. The puppies are adorable too. Happy New Year! I am so happy to hear all the good news! It is GREAT to hear that claire is doing so well, I hope the new year brings much joy to your family. As always if you need anything just let me know!! 🙂 Tell the family I said hi and Happy New Year! Wonderful news, both educational and inspiring! Your post was upbeat and filled with optimism and joy. Good for all of you! Thank you for sending. So happy there’s such wonderful progress with Claire now, with the promise of more to come. And how on earth can you pick just one puppy from that adorable litter?! What a fun time is ahead for you, Tiffany and Tyler, along with Autumn, Heidi and Claire. And it’s another blessing that the girls are enjoying their new school. There are so many terrific things for you to focus on! I look forward to the next post. What joy to get your blog update in my email today! I have been wondering how everything is going and am so grateful for this update – and especially grateful to read that she is progressing so well! Your lives have been very busy and full! Know that you are still close in our thoughts and prayers. May the new year be full of love, hope and daily mercies for you all! wonderful – i thought about your family over the holidays and am happy to read the progress!! I am so excited to read this update. I am very happy that Claire is making progress. Our family thinks about all of you often. My son asks about Claire all of the time. He is fascinated with her progress. That is awesome that Heidi and Autumn are adjusting to their new school. They have been thru a lot. I am glad that your family had a great Christmas. God has given us so much to be thankful for. I look forward to the next update and we will continue to have your family in our prayers. Glad to see Claire is doing so well:) Wow! We take for granted the 1000s of nuances our brain has to handle; what an incredible design God had in mind.